What's New: BBB Accredited Business? Or A Lie? consumers are looking for such assurances, so they affiliate themselves with companies like the BBB. When a business signs up as a member of the BBB they can also request to be a BBB Accredited Business. You have to be an accredited business in order to display this logo. Although, many companies put this logo on their website even though they are not Accredited. 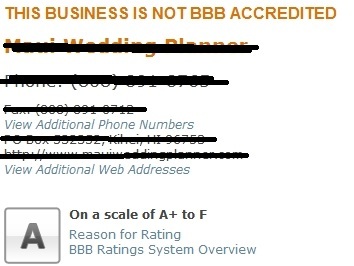 This particular company we found, not only displayed the BBB Accredited Business logo on their site (which is completely illegal), they also indicate that they have an A+ rating. Come to find out, they don't even have an A+ rating, they have an A rating. This particular company has has 2 complaints in the last month! Be careful taking for granted that a company is Accredited by the BBB just because there is a logo on their webpage. Would you want to do business with a company that has lied, not once, but twice, in the first few lines of their web site? Hawaiian Island Weddings IS an Accredited Business with the BBB. You can see our Affiliations Page at http://www.hawaiianislandweddings.com/affil.html and you can see the logo on all pages that deal with making payments. See our A+ rating at http://www.bbb.org/hawaii/business-reviews/wedding-consultants/hawaiian-island-weddings-in-kihei-hi-22000967 - You will see that we have been an Accredited Business since 11/1997.